The short video shows the Brazilian couple Hugo Rohling and Cinthia Zanun during the evening party on their wedding day. Rohling became partially paralyzed after a serious motorcycle accident five years ago. 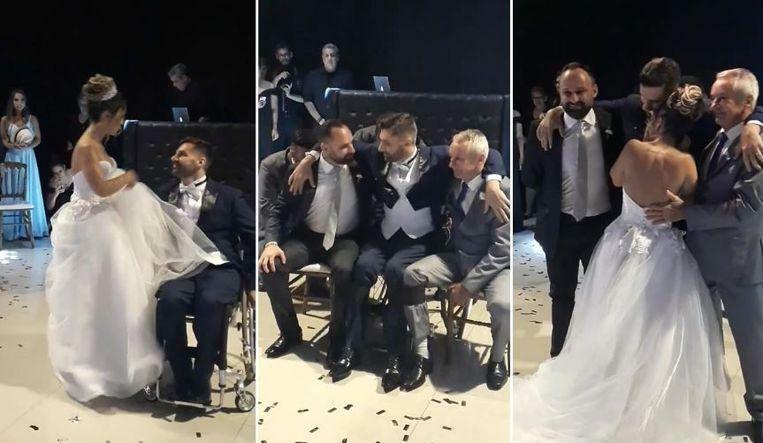 After performing a rehearsed dance with his wife while he was in his wheelchair, the groom surprised his new wife by standing up with the help of his father and his brother. The men tied their legs to those of Rohling, allowing him to stand up. In this way, the couple could, after the official opening dance, also perform a standing ‘slow’ on the notes of ‘Make it to Me’ by Sam Smith. The emotional video has already been viewed more than 16 million times worldwide and has already been shared more than 400,000 times. Before the groom stood up as a surprise for his wife, he danced with her a rehearsed dance in which he was still sitting in his wheelchair.